It's early afternoon in February and I'm out walking in my hinterland. It's not as stark and barren as the series I'm watching but it is the back of beyond. It's rained heavily for a day and a half, non stop. Now the clouds are white and scuttling across the blue sky. I need to escape the confines of my four walls. It's cold, the rain clouds dumped snow on higher ground. I can see, now the rain has cleared, white-topped mountains far into the distance. That's the beauty of the mountain ranges that almost surround where I live, you can see for miles. I'm relieved the snow is only on the high ground, I live at 700m above sea level, the snow line height is around 1,000m. I walk between olive trees. It is silent.There are traces of recent activity by olive pickers strewn on the ground, they must have left in haste. It's mid harvest time but the rain has given everyone what must be a welcome day off or two. If it's fine they work, if it's wet they don't. These are the first wet days since end October/early November. It's welcome to me, not the rain but the absence of workers. Workers use machines, machines make noise. When I first moved here twenty-two years ago silence reigned. 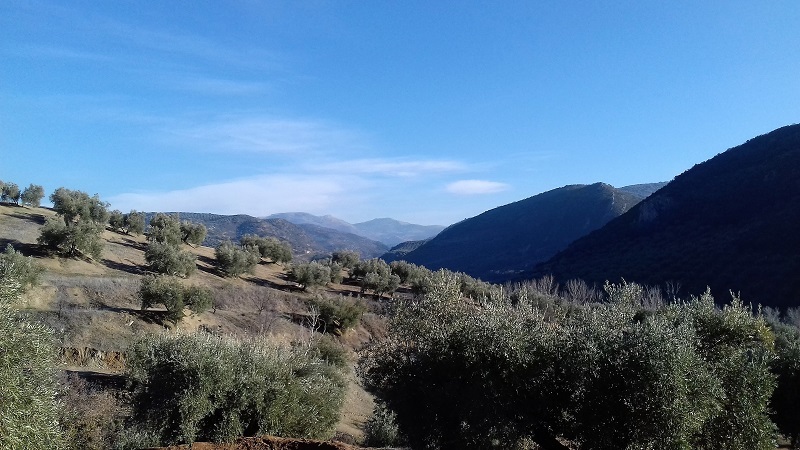 During the olive harvest the tap tap of piquetas – the traditional long wooden stick echoed through the valley. Followed by the post harvest pruning, done alternate years, by chain saw. A distant hum. Now it's a constant roar of machines. I criss-cross between olive trees. Each one looks more or less the same to me, not knowing an exact route but aiming for the mountains beyond to get my bearings. It's a little damp underfoot but incredibly, due to the amount of rain we've had, the soil doesn't stick to my boots, it's only the dew on the grass that is wet. It had been so dry that every drop of rain we've had has been soaked up and there's an absorbent capacity for much more - I'd rather that waited for a while. Just a few months ago there were carpets of wild mushrooms in the green, weedy 'lanes' between the lines of trees. Unending varieties that I photographed but daren't pick. That is one of my desires for this year – to learn which ones are edible are which ones are not. I'm presuming those I saw are not. If there was anything edible to forage around here, I'd barely see it. My elderly neighbours know their plants and the foraging force are out there early when anything edible is around. Now into February the asparagus plants are beginning to perk up, then they'll send out new shoots, that won't be long, a sure sign of spring. My favourite season. I'm always walk careful about where I walk. I'd hate to tread on an early wild grape hyacinch or one of the myriad of orchids that I'm still trying to identify. I even try to avoid the ripe black olives laying on the ground. Missed or fallen from the tree, they may be collected or may not but my walking boots make a cert they will be collectable. The peace is deafening. Even my footsteps are silent on the earth. My dog tearing around at a distance. Sometimes I call her back, just to make sure she is still somewhere nearby. Tomorrow the groves will be alive again. Olive pickers and machinery. Noise. Chattering voices, though not so much. The hubbub of vibrators and blowers overshadows voices. If they can speak loud enough or hear what's being said, it doesn't reach me over the mind-numbing, rumbling noise. Long gone are the days I could sit in the sunshine and read to the gentle tapping or the drifting lift of a Sevillana song in the air. Now if the harvesting is very near my house I take the car and escape the noise. I'm surrounded by olive trees. They are my neighbours on three sides. It's great walking country, barely a fence (though many more than when I arrived) to halt the direction I head in. 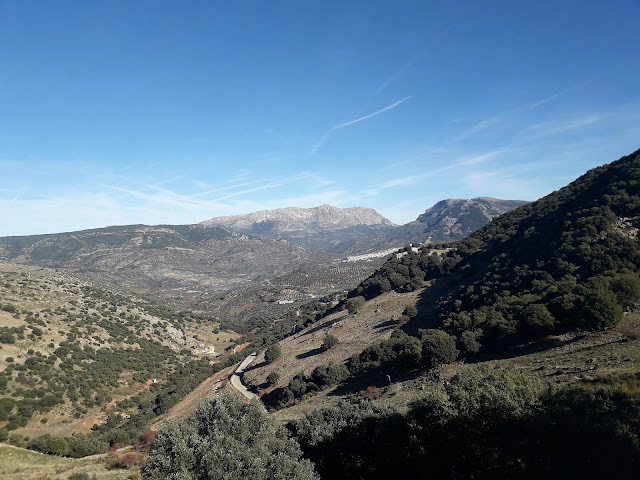 The Sierra Sur de Jaen is just one range of mountains in Jaen Province. 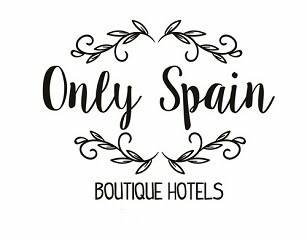 Jaen not only has over 66 million olive trees but also four Natural Parks, one of them Cazorla, Segura y Las Villas Natural Park is the largest in Spain, within its borders. That's a lot of walking country. It's dark so early now, when the workers leave around 5pm it's a good time to step out, then it's the groves I head into, the roads are heaving with laden 4x4s and tractors heaving laden trailers of olives to the mill in town. To be washed and weighed, crushed and filtered for the prize extra virgin olive oil Jaen is famed for. This is the main harvest. For the early unfiltered green oil, more a juice than an oil, the olives are harvested much earlier. October time is usually the optimum time for the gathering of olives which are changing from green through purple to black. This is the gourmet Extra Virgin Olive Oil. One for fairly quick consumption, it doesn't keep long, but is quickly consumed anyway in my house. Fresh baked bread lightly toasted then stabbed so that oily, bright green juice soaks into it, maybe adding freshly grated tomato on top. Heaven. I live with the noise for two or three months for year long breakfasts such as this.